I have never seen a more polarized debate then the car tire VS. Motorcycle tire argument. Even dino vs. synthetic oil doesn't raise as many hackles or push as many buttons. But, it seems the argument is always between people who have tried the darkside and love it vs. people who won't try it and are convinced it's the dumbest thing you could do to a bike. Well, being of a scientific mind and experimental nature, I'm going to give it a try. Yesterday, I was going to take my Shadow to work and noticed it wasn't rolling very well. Seems I picked up a nail and the rear tire was flat. Seeing as how it is pretty much bald (I was hoping to make it through this riding season), it's not worth trying to repair. So, time for a new tire. And, I decided it's time to try the darkside. So, all that aside. I've got a 2005 Honda Shadow Sabre - VT1100C2. Will a Douglas Performance GT H 205 65 15 fit my rim and fit my bike? Has anyone tried this exact tire? I know people have used the Douglas Xtra Trac II on other Shadows - but I can't find a 205 65 for a 15" rim. I'd really like to go as tall in diameter as I can since the Sabre is geared lower than the ACE or Aero and revs pretty high at highway speeds. I took the wheel and tire off last night. And will mount a car tire as soon as I can decide on which one to use. Hopefully you guys can help me out with that. After a bit more research, the only thing that really concerns me is the bead diameter. I've read that some are quite a bit smaller than 15" (like 14.5 - 14.625")- and that they won't fit on my rim. Time to look through the tire racks, I guess. So, I took some measurements. The bead to bead diameter is about 14.75" I think that'll work. I should have enough clearance at the swing arm - barely. I guess I just gotta try it! motopsycho wrote: So, I took some measurements. The bead to bead diameter is about 14.75" I think that'll work. I should have enough clearance at the swing arm - barely. I guess I just gotta try it! Mine was about 14.75 when I measured and it went on alright. Thanks for the reassurance! Did you run the 165-80-15? I'm really hoping a 205-65-15 will fit. All the measurements seem to indicate that it will. the 165-80 and the 205-65 have pretty much the same sidewall height. But, the 205-65 is obviously wider. 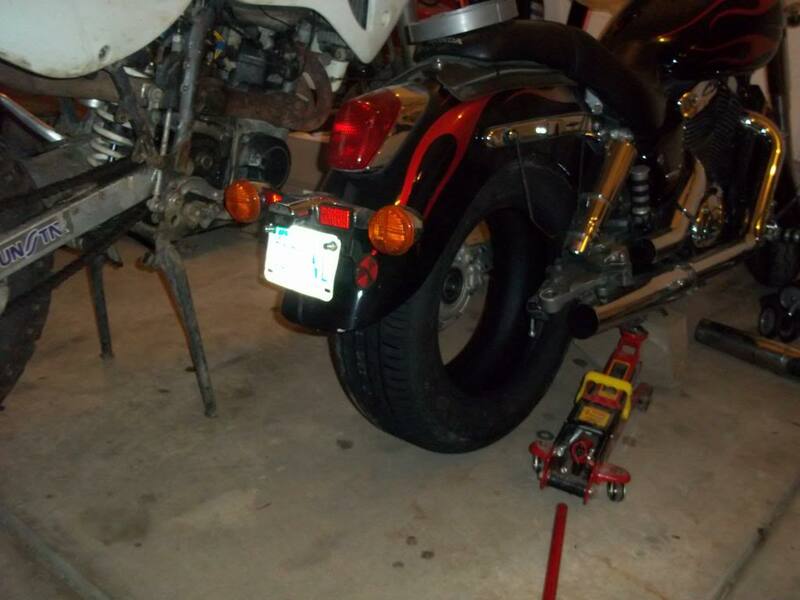 How much clearance do you have between the sidewall of your tire and the swing arm? I put on a 165/80-15 Nexen. It's actually a little narrower than the stock 170/80-15 MC tire, so there's About 5/8'' on each side of the tire,I believe. Any chance you could verify those width numbers? If you only have 5/8" of clearance on each side of a 165 tire you only have 7.75" of clearance on your swing arm - or your 165 is wider than advertised! 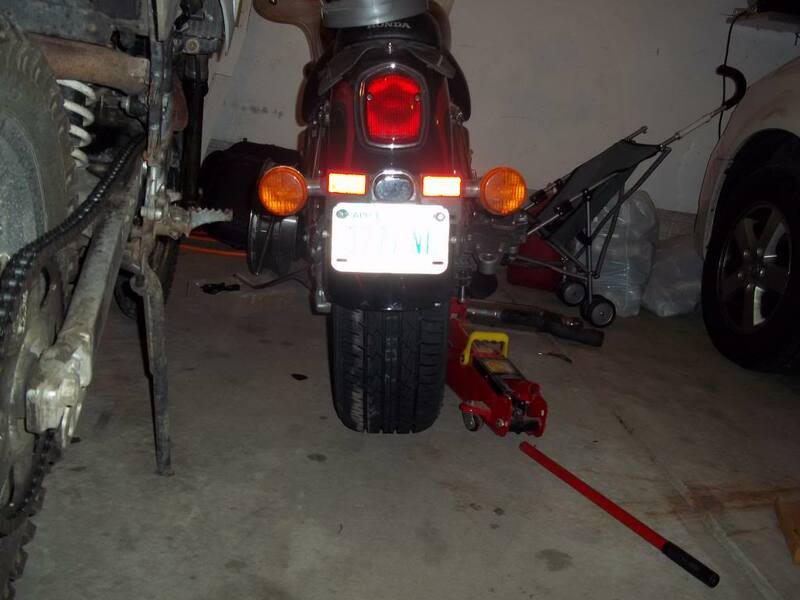 I've got about 8.25" of width at the swing arm of my Sabre - if the 205 tire is actually 205mm, I should have between 1/16th and 1/8th of an inch clearance on both sides. Not much, but hopefully it's enough! I wonder if I'd get escorted out of Wal Mart if I went in there with a 12" calipers! motopsycho wrote: Any chance you could verify those width numbers? 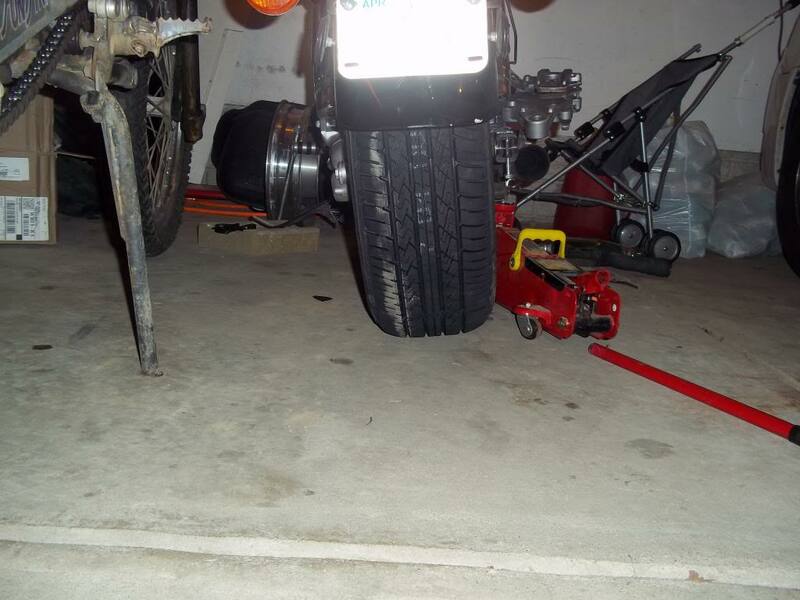 If you only have 5/8" of clearance on each side of a 165 tire you only have 7.75" of clearance on your swing arm - or your 165 is wider than advertised! That was just a guess. I'll try to stick something in there and see if I can tell how much clearance there is. I cut of a piece of a tape measure stuck it between the tire and the drive shaft and best I could tell there is about 1'' clearance. Ahh! That's more like what I was hoping! Thank you for checking that. It should fit fine. Not going to get a chance to mount it until Saturday - but I'll keep you guys posted on my progress when it happens. The tire looks awesome on the bike! But, it's a tight fit. Real tight. There's almost no clearance at the swing arm, and the tire will rub the fender if the suspension compresses enough. I don't know if the suspension has enough travel to compress enough to rub the fender - so it may not be an issue. So, what do I do? I bought the tire at Wal Mart and I'm sure I could exchange it for a smaller one. That'd be the safe route. But, if I mount the tire to the rim and it won't fit on the bike, I'm sure I won't be able to return it. I either need to take the safe road now, roll the dice and hope it fits. If it was me, I'd exchange for the next smaller size. Yeah, that would be the smart move. But, I'll be left wondering if this one would work! Is it worth a $70 gamble? I just don't know! Bah! I think I need exchange it while I can. The stock tire is able to go all the way up in the fender. This car tire won't. 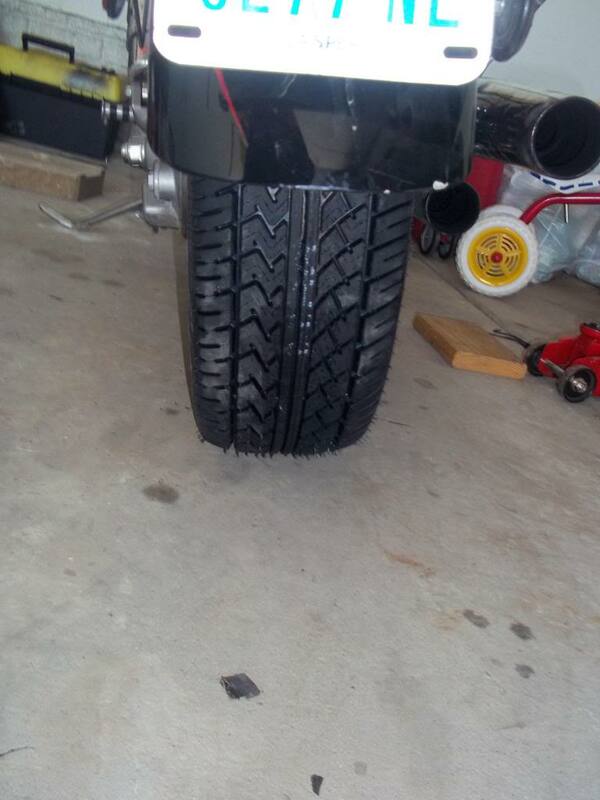 I gotta imagine that the tire needs to go up in the fender when the suspension compresses. I really don't want to deal with the tire and lube people at walmart again! They couldn't figure out how site to store worked - I can't imagine what a curveball like an exchange will do to em! the 205 65 15 is close and might fit. They have a 195 65 15. I"m thinking I'll just exchange it. That extra 10 mm will make a world of difference, I think. It did take a bit of pressure to get the bead out on the rim. One side popped out at about 85 PSI and the other side didn't pop until about 93 PSI. I was real close to giving up, but I've heard people going up to 120 without exploding anything, so I kept pushing. I was going to stop at 95 and try to relube it, but I didn't have to. Hoping to get a test ride on her this afternoon. I'll post a ride report if I can sneak out. I drove my bike on the darkside for the first time this evening. I managed to put about 30 miles on the bike this evening. Verdict? Handling-wise, nothing changed. It drove, turned, acclerated, and braked just like it always has. I've been riding motorized 2 wheelers for about 3 decades. I know how a bike is supposed to feel. My bike on the darkside didn't really feel any different than it did on a MC tire - except for 3 things. 1. If I rolled from a high speed RH sweeper to a high speed LH sweeper (and vice versa), I could feel a transition that wasn't there before. There is a noticeable transition from the tire not being on the entire tread, to it being on the entire tread, to it being on the opposite side of the tread. It doesn't slow me down or negatively affect the performance. It's just there. 2. Before going darkside, I could get the bike a little sideways if I was accelerating from a T intersection and turning. There is a sweet spot in 1st gear that I could pin the throttle and break the back end loose a little bit accelerating through a 90° turn. I can no longer do that. Even through a turning acceleration, I have more traction with a CT did I did with a MC tire. 3. It takes a lot more rear brake to lock up the back end. Straight line braking is improved drastically. Bottom line? I utterly and completely failed at disproving the darkside as a viable alternative to MC tires on a cruiser. I'm only 30 miles in, but if this tire lasts 10,000 miles - I don't ever see going back to MC tires. motopsycho wrote: I drove my bike on the darkside for the first time this evening. What brand is that tire? So far, it looks like a winner! motopsycho wrote: Bah! I think I need exchange it while I can. The stock tire is able to go all the way up in the fender. This car tire won't. I gotta imagine that the tire needs to go up in the fender when the suspension compresses. Also, I wanted to apologize for this remark. The exchange process was quick and smooth. The guy that did the exchange was very helpful and friendly. Granted this is the first positive experience at Walmart tire and lube - but it was a positive experience. I shouldn't have assumed the worst! Oh, and I'm up to about 60 miles on the darkside. No complaints whatsoever. Lets see how the first 5k miles treat the tire - that's all the last MC tire lasted. I'm over 200 miles on the darkside and I'm officially a convert. I've seen no bad tendencies and it feels a lot more stable in some situations. I was concerned about how it would do on gravel, but for some reason, the CT actually handles gravel better. I found that as a happy surprise since here in IA, once you leave a city - the roads are either interstate or gravel! Ever wondered what a darkside tire looks like on the gravel? I do. Or rather did. I'm a bit surprised at how much the sidewall flexes during real aggressive turns. But, at 2:12, you can hear the foot peg hit the pavement. That's as far as my bike will lean. The sidewall does flex, but there's still alot of contact patch on the road - even at full lean. Is the 2005 Sabre the same measurements as a 2006 Spirit? I am using the same MC tire size as you and trying to see how big I can go.